It is little wonder that the everyday can sound so much more exciting when expressed in Italian. It is after all one of the romantic languages which means it derived from Latin rather than the pages of a Barbara Cartland novel. Take pesto, for example. In English this translates as paste, a rather grey, unappetising description for a combination of ingredients to excite the tastebuds and dazzle the eyes thanks to its vivid colour. There are two basic types of pesto, green and red, both handmade and produced commercially, but the former is the most traditional and certainly the most famous. Where does pesto come from? Well, suggest to a Ligurian that it comes from anywhere else and they are likely to reach for the pestle and mortar used to make it in the domestic kitchen and threaten to inflict serious damage. Once calm has been restored, your newly acquired Ligurian friend is likely to suggest the following method for mastering the region's signature product based on serving it to six people as a dressing for pasta. 50 grams each of butter and parmigiano reggiano, and extra virgin olive oil. Place a skillet on a low heat and add the pine nuts, tossing them around the surface until they are lightly toasted.Remove immediately before they begin to burn. Take the basil leaves and garlic and grind to a paste in a pestle and mortar. This job could be done in a food processor but the rougher texture achieved by manual labour is more satisfying. Pour in the pine nuts and break them down into the mixture, then add the parmigiano and mix everything together with a spoon. Transfer the mixture to a bowl and begin drizzling in the olive oil, amalgamating the ingredients until a slightly loose texture is achieved. Finally beat in the butter to achieve a silky finish to the sauce and adjust for seasoning with some freshly ground salt. For a truly Ligurian feel to the finished dish, stir the pesto into trofie pasta and 150 grams of green beans, steamed or boiled until tender but still retaining a bite. Cannellini beans also work well with trofie and pesto. The more adventurous could substitute basil for another green leaf such as parsley, rocket, or even coriander. Such combinations are available commercially, although they would be frowned upon by the more traditionally minded Ligurian. Red pesto sauce, again for six people, calls for 10 sun-dried tomatoes, either under oil or dried and reconstituted, a clove of garlic, a handful of pitted black olives, 50 grams of pecorino romano cheese, extra-virgin olive oil and some flat-leaf parsley. The tomatoes and olives should be finally chopped before grinding in a pestle and mortar together with the garlic. Then add the cheese, transfer to a bowl and amalgamate enough olive oil to make a loose mix. Then stir in the chopped flat-leaf parsley and adjust for seasoning with salt and freshly ground black pepper. 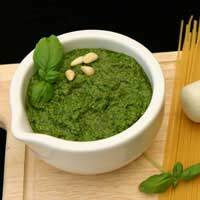 Pesto not only combines well with pasta but can be used to add an extra layer of flavour to casseroles, or as a marinade or garnish for grilled meat or fish. It also enhances side dishes of boiled vegetables such as green beans and potatoes. I like pesto I do. Please send me any information you have on pesto.